Sian Redgrave has risen to the occasion to be crowned Australia’s Best Amateur Baker after winning over judges Maggie Beer and Matt Moran in tonight’s final episode of THE GREAT AUSTRALIAN BAKE OFF. 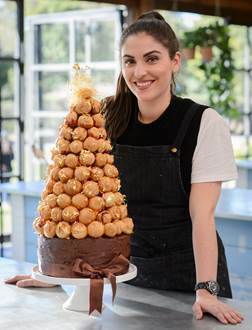 The 23-year-old fashion stylist from Perth proved too strong for her competition, pulling out all stops in the final Showstopper challenge when she baked an extravagant Croquembouche perched on top of a chocolate mud cake. She beat Jasmin Hartley, 26 from Mackay, who whipped up an incredible three-tiered wedding cake complete with caramel popcorn and white chocolate shards, and Suzy Stefanidis, 45 from Melbourne, who created an elaborate gingerbread church complete with an edible engagement ring. As well as earning the title of Australia’s Best Amateur Baker, Sian’s Italian Cheesecake Brownie recipe from episode five will be featured in delicious. magazine’s March 2016 issue. Hosted by comedians Claire Hooper and Mel Buttle, THE GREAT AUSTRALIAN BAKE OFF became the highest ever-rating show on LifeStyle FOOD and inspired amateur bakers across the nation. Now Foxtel is looking for more of Australia’s finest home bakers to take part in the next series. Are you passionate about your pastry? Does your sponge rise to the challenge? From biscuits to bread, pies to pavlovas are you ready to step into The Bake Off Shed, throw on your apron and have your bakes judged by the Baroness of the Barossa, Maggie Beer and culinary genius Matt Moran? If you’re a Star Baker in the making, head to www.lifestyle.com.au/applynow for details. On your marks… get set… APPLY!